Russia at the helm of “seamless” economic space. Construction of facilities for the APEC summit in Vladivostok will cost the federal budget 220 billion rubles, exactly as estimated and not a penny more. Opportunities for additional funding have been closed, the first deputy chairman of the government, Igor Shuvalov, told journalists yesterday. The first deputy prime minister praised the changes that are taking place in the city in connection with the Construction of the Century. After all, the total investment in preparations for the APEC summit, including the funds of investors and the region, is estimated at 600 billion rubles. In two years, the city has seen the rise of more than 2 million square meters of new buildings, water treatment facilities, and modern reverse osmosis units equipped with an enormous amount of electronics. And though excavation works continue throughout the entire city, and its residents are still experiencing some temporary inconveniences, in June Primorye’s capital appeared in all its glory. It won’t be embarrassing to host foreigners here to conduct international business and develop international trade. “Not a trace of the old provincial airport remains. Now it is possible to get to the city center in 25 minutes, instead of the previous hour and a half, and stay in four and five star hotels, which did not exist until now,” noted Shuvalov. Meanwhile, campuses of the Far Eastern Federal University, which has no equivalents in Russia, have been constructed in the “new Vladivostok”, as the city is referred to by its residents, said Shuvalov. The university, he explained, will be the center of international education, where students and professors from Australia, Singapore, America and other countries of the region will work and study together with Russian citizens,” he continued. He went on to talk about the first-class healthcare clinic and the rehabilitation center located on the campus of the Faculty of Medicine and Biology. “Many Primorye residents are currently traveling to seek treatment in Seoul, leaving all of their money there. The clinic located on the university’s campus will introduce new medical service standards, similar to those of the American university research hospitals. Incidentally, due to the changes, some are already calling Vladivostok Russia’s third capital, which will shift large economic projects east,” said Shuvalov. He stressed that Russia's 2012 APEC presidency is aimed mainly at one thing, namely economic expansion to Asian countries. The eastern direction is currently becoming the engine of economic growth, which could also be the driving force of Russia. “Russia’s desire to establish itself in the APEC is not necessary for the sake of the economic club itself, but specific projects,” explained Shuvalov while answering Rossiyskaya Gazeta’s (RG) question about what economic dividends Russia expects to receive from APEC. According to him, if during the year of our presidency we will be able to sign a free-trade agreement with Vietnam, for example, then we could say that the year has not been wasted. Meanwhile, trade negotiations with this country are already in full swing. “Let them bring textiles and produce light industrial goods on our territory; we will open our markets to that. We, meanwhile, could export engineering products and power equipment to Vietnam,” said Shuvalov. Similar interests apply to Singapore and Indonesia. At the same time, by bringing “a part of Europe to Asia”, Russia is getting the opportunity to create “a seamless economic space,” he noted enthusiastically and stressed that free-trade agreements in the Asian region will, in essence, complete the creation of the global construction of the new infrastructure of Russia’s foreign economic relations. It is being created in the context of the Customs Union, which will come into effect in 2012, the Common Economic Space, and free-trade zones with the CIS countries (though an agreement is yet to be ratified, said Shuvalov). This series of events is also expected to include Russia’s entry into the WTO. Moreover, Russia’s role as a leader of integration events does not end with the APEC summit. “In 2013, we will be hosting the G20 summit,” pointed out Shuvalov. 1 Russia's biggest port on the Pacific Ocean, population - 616,884. The terminus of the Trans-Siberian RR and the Northern Sea Route, the chief base of the Russian navy in the Pacific, and a base for fishing and whaling fleets. Distance from Moscow - 9250 km. The annual temperature is +5°C (average temperature in January is -14°C, in August is +24°C). 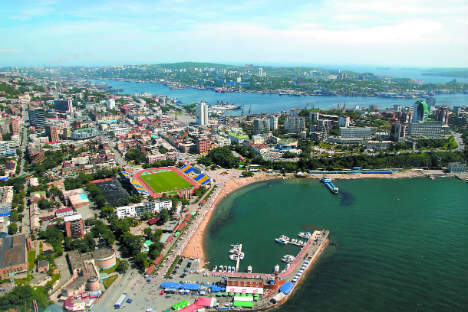 2 The city's location makes Vladivostok a strategic transportation hub in the Far East for international cargo shipments. The port handles cargoes primarily from South Korea, China, Japan, Taiwan, Thailand and Vietnam. 3 The city is the chief cultural center in the Russian Far East. Among its many educational institutions are the Far Eastern branch of the Russian Academy of Sciences and the Far Eastern University. Main industries: car and equipment construction, shipbuilding, fishing, food production and timber processing.